Given such realities, Baibesik, a newly established settlement for ethnic Kazakhs at the end of a poorly constructed road just outside Almaty, is a telling example of what is needed. There, scores of returnees from China, Mongolia, Uzbekistan and other faraway places struggle to erect homes themselves in an effort to secure a better life. Despite an obvious lack of electricity, water, sewerage and other public amenities, returnees see the muddy parcel of land as their best shot yet towards obtaining registration - and eventually Kazakh citizenship. Under current plans - already approved by the Almaty city council - some 186 homes will be built, providing much-needed housing for some 1,000 returnees. "I see my future in Kazakhstan. I see my future here," Boken Shamylkizy, a 59-year-old grandmother from Mongolia, told IRIN, having arrived only recently to join her son and his family - all of whom have received their citizenship. "As a Muslim, I connect to this place," she said. Others, however, have been less fortunate. Although Zhainasyn Izaeva arrived from Uzbekistan over three years ago with her husband and three children, she has yet to receive citizenship, and her husband's meagre income has not yet sufficed to enable the family to complete the one-room makeshift shelter made of plaster boards and tarpaulins they started building a year earlier. "This isn't a house. We need help in doing this," she told IRIN. IOM fully recognises such cases and has been working to raise money for the project, but so far donor response has been limited - making assistance for people like Izaeva all the more difficult. Currently, IOM plans to spend US $25,000 on a carpentry workshop and construction material to assist such vulnerable families, as well as on improving the road within the settlement and adding several solar panels as temporary measures. Providing electricity and drinking water will remain the task of the city administration. According to Tschanz, most returnees are being left for years without adequate start-up assistance, training, or citizenship and, as foreigners, without access to credit facilities. 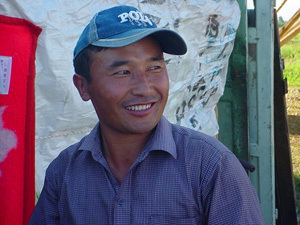 Consequently, many returnees remained part of the poorest and most marginalised segments of Kazakh society, Tschanz said. Meanwhile, Kymbat Kanagatuly, a 28-year-old electrician from China, says his life is now brighter after arriving in Kazakhstan three years earlier. Although he speaks no Russian, as is the case with most other returnees from China - 45 families in Baibesik alone - he has fared better than most in assimilating, and now, together with his wife, runs the community's only shop. "I want to learn Russian. I must," he told IRIN. Whereas many returnees can speak Kazakh, many still have no Russian, an ability considered critical to securing a good job. "Without Russian, you're lost in Kazakhstan, while without Kazakh you are lost when you want to find a job with the government," Tschanz said. Moreover, many Kazakhs from China were generally only able to write their language in the Arabic script and were unfamiliar with the Cyrillic alphabet, he added. The language factor greatly influences returnees in deciding where to resettle. Whereas the government prefers them to go to the north, offering more benefits to those who do so, most prefer to stay in the south, where Russian is less important. 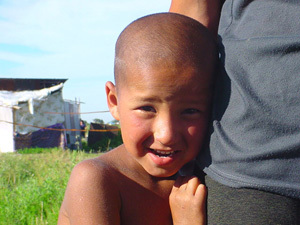 At present, 75 percent of all oralmans prefer the four provinces of South Kazakhstan, Kyzl-Orda, Zhambyl and Almaty. "The more you go north, the more you need Russian as the language of communication. The more you go south, the less you need it," said Tschanz. Another factor influencing resettlement is the country from which the returnees are arriving. At present, most are coming in from Uzbekistan, particularly from the autonomous republic of Karakalpakstan and Navoy province, which constitutes the disaster area south of the Aral Sea. According to IOM, many find it impossible to sell their houses in these areas, and even if they manage to do so, receive so little that after paying for their trip to Kazakhstan, they start with virtually nothing. Furthermore, those returnees not coming under the quota system are supposed to receive assistance from the local provincial authorities, but generally those resources are insufficient. Meanwhile, the returnees who resettle in the north generally come from Mongolia, where climatic conditions are most similar to their previous domicile. [Kazakhstan] A young Oralman child with his mother. According to IOM, however, even after resettling, the returnees often decide to move elsewhere - to places where they have relatives or expect to find work opportunities; or to areas where the climate more closely resembles that of their former home. However, after such subsequent migrations, the returnees cannot expect to receive any more assistance from the authorities. Whatever their destination, the fact remains that more returnees will follow, a clear demonstration that much more is needed to facilitate their successful reintegration than is presently on offer, while enhanced transparency in the benefits-distribution procedures is also needed. All this in a country of 15 million and geographically almost the size of India, and where the president himself says population growth is key to its future stability. While the government has spent considerable funds on transport, housing and initial financial support for repatriates, training, start-up assistance and credit facilities - crucial in the first years after arrival - were overlooked, allowing the oralman community to become increasingly marginalised, impoverished and frustrated. In an effort to begin addressing this, the government has started to shift its focus from repatriating Kazakhs to integrating those who have already returned. Nonetheless, much more is needed. Meanwhile, back at Baibesik, Bakhtyar Kelmanov is just happy to be back. Though his house lacks water, electricity, flooring and even a roof, he is convinced more than ever that the home taking shape around him will give him the necessary status to secure his family's future. "I am happy to be back in Kazakhstan. This is my motherland," he declared proudly.